Despite an order issued by the Caribbean Court of Justice (CCJ), the Government of Belize (GOB) has once again decided not to pay the now over $95 million owed to Lord Michael Ashcroft’s Belize Bank for a loan to Universal Health Services (UHS). The decision to abstain from payment was debated during a sitting of the House of Representatives in Belmopan City on Friday, August 31st, with a unanimous ‘NO’ vote from members of the current United Democratic Party (UDP) administration. Members of the Opposition, the People’s United Party (PUP), walked out without casting their votes. The debt stems from the days of the PUP administration when then Prime Minister Honourable Said Musa signed a $33.5 million loan with the Belize Bank without the National Assembly’s approval. It is alleged that Musa secretly placed the Government as the guarantor for the loan in 2004 in an attempt to improve the health services in the country. That debt continues to balloon, fuelled by interest and legal fees against Belize. 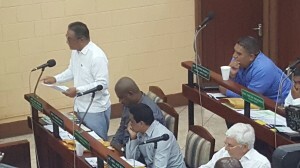 During the debate at the Belmopan Sitting, the Opposition blamed the current administration for allowing the loan to grow to almost $100 million. They also warned that if nothing is done, the loan will continue growing and adding a heavier burden on the taxpayers. PUP Leader Honourable John Briceño told the House that before the UDP government, the PUP administration had paid the UHS loan. “The debt had to be paid, and so Prime Minister Musa managed to get the funds from our friends, including Venezuela, via grants to pay the debt,” said Briceño. 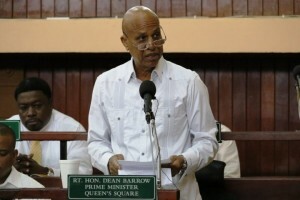 He added that when Prime Minister Dean Barrow and the UDP came into power in 2008, they instructed the Belize Bank to return the money to the government. This move by the UDP government is what the PUP is calling the birth of the $95 plus million loan that haunts Belizeans today. During the House Siting, former Prime Minister Musa admitted to signing the loan. He indicated that if it was a mistake, his government corrected it and paid off the loan before they exited power. “Prime Minister Barrow has created, through reckless and misfeasance, a debt of $95.6 million, I accuse him of incurring this debt. It is a UDP debt, and it occurred because of his attitude,” said Musa. Prime Minister Barrow and the UDP shot back denying the Opposition’s allegations. The UDP said that the PUP had diverted funds the government had received from Taiwan and Venezuela to the tune of $40 million Belize dollars to pay the UHS loan. The UDP argues that those monies had been given for other programs in Belize, like housing and human development. Barrow’s presentation made it clear that by bringing the matter before the House, it showed his government’s willingness to resolve the issue. As Barrow continued debating the UHS debt, members of the PUP walked out, leaving only the members of the UDP inside the National Assembly building. The vote whether the government should pay for the debt became a historic one, as only one side of parliament would participate, and they voted ‘No.’ Barrow later told the media the UHS issue is a PUP headache from start to finish and that Belizeans on the whole, do not want to pay the debt. Before 2008, after the UHS received the loan from Belize Bank, they began experiencing problems making payments to the bank. When the bank could not get their monies, they called on GOB to honor its guarantee. This led to a number of court hearings, beginning at the Belize Supreme Court and Court of Appeal. The legal battle then extended to the London Court of International Arbitration, the Privy Council in London and the United States Supreme Court. They all upheld the legality of the loan note and government guarantee except the Belize Supreme Court and Court of Appeal. In the end, the case was taken to Belize’s highest court system, the CCJ. In November of 2017, the CCJ found that GOB was liable for the loan note and guarantee signed by the Musa administration on behalf of UHS. In the meantime, Belize Bank is seeking a declaration that the Minister of Finance, who is Prime Minister Barrow, shows that he has failed to pay, along with an order giving the government ten days to settle the debt. The first hearing of such declaration is scheduled for September 17, 2018.